1906 In accordance with a plan of cooperation entered into with the Forest Service in 1905, an OPR engineer begins a thorough investigation into the roads and trails in Yellowstone Forest Reserve. After completing the work on October 14, the engineer prepared a report containing estimates and recommendations for the road improvement and maintenance. 1964 Near the New Hampshire Avenue interchange, Maryland Governor J. Millard Tawes cuts a ribbon officially opening the Capital Beltway around Washington, DC. He calls it a "road of opportunity." Administrator Rex Whitton calls it a "huge wedding ring for the metropolitan area" while Representative Carlton R. Sickles (MD) makes the day's briefest speech: "I'm so happy, I can't express myself." 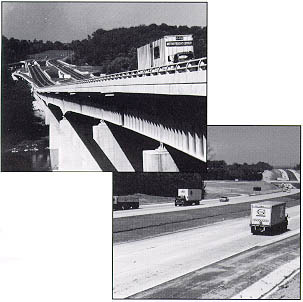 Scenes from the Capital Beltway in 1964.